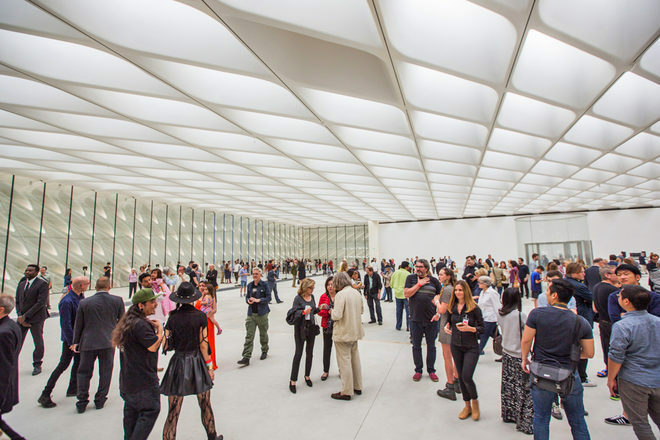 The Broad is a major addition to LA’s Grand Avenue cultural district that includes MOCA and the Music Center. 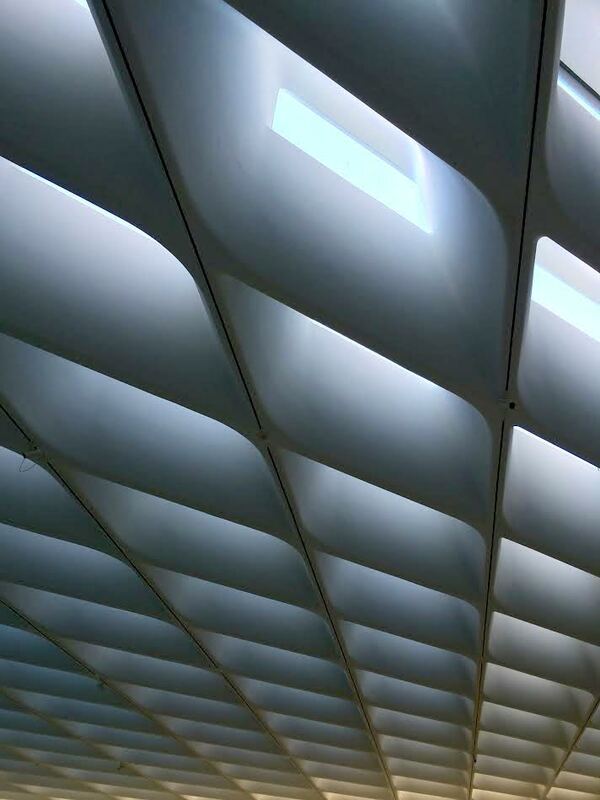 The $140 million building was designed by Diller Scofidio + Renfro with a “veil and vault” concept that permits natural light into the galleries. The much-anticipated museum opened for a preview this Sunday with a rare opportunity to see its third floor – an impressive uninterrupted 35,000-square-foot gallery space – before the installation of partition walls. The building’s first and second floors are still under construction and unfortunately inaccessible. Rather than the stairway or cylindrical glass elevator that ascend through the vault at the core of the building, visitors on Sunday arrived at the third floor through a freight elevator that will soon transport works by Jeff Koons, Keith Haring, and Cindy Sherman for the museum’s inaugural exhibition. The honeycomb-like exterior filters daylight into the third floor through the roof and glass walls on the north, east, and south sides. From inside, the veil provides limited views onto Walt Disney Concert Hall, MOCA, and The Broad’s new public plaza that has been planted with 100-year-old olive trees. 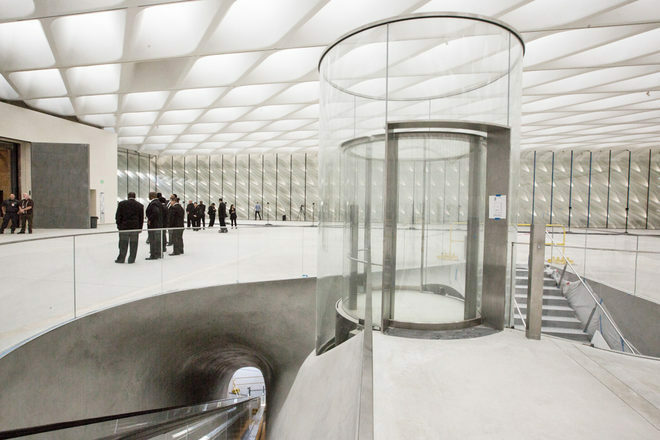 LA’s perpetual sunshine, permitted through more than 300 skylights, is a primary feature of the gallery. The building’s scale and light conditions make it feel surprisingly understated and not at all austere. 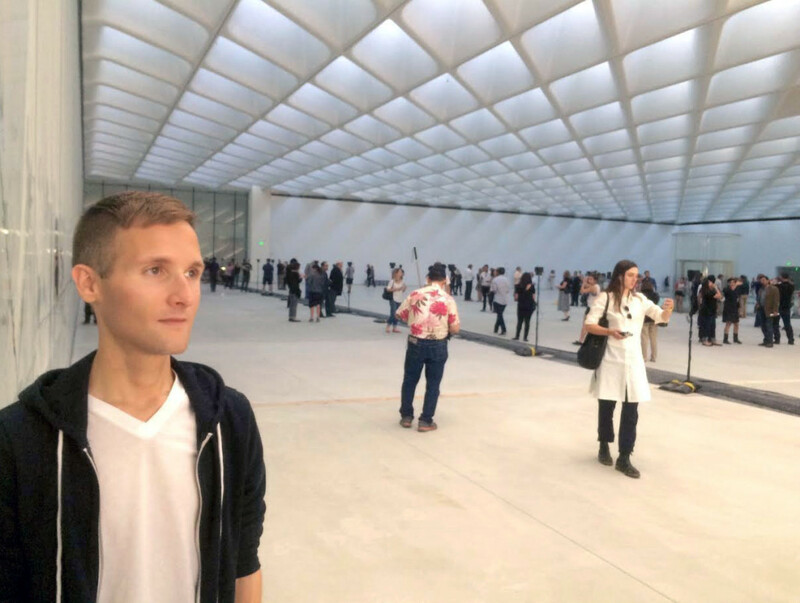 For this one-day event, titled Sky-lit: Volume, Light, and Sound, The Broad commissioned two installations. BJ Nilsen’s DTLA was an audio collage of recordings from neighborhoods surrounding the museum, and after sunset, Yann Novak’s Stillness projected atmospheric images of Los Angeles and Seattle onto the gallery’s 200-foot west wall. The installations emphasized The Broad’s architecture, site, and environment. 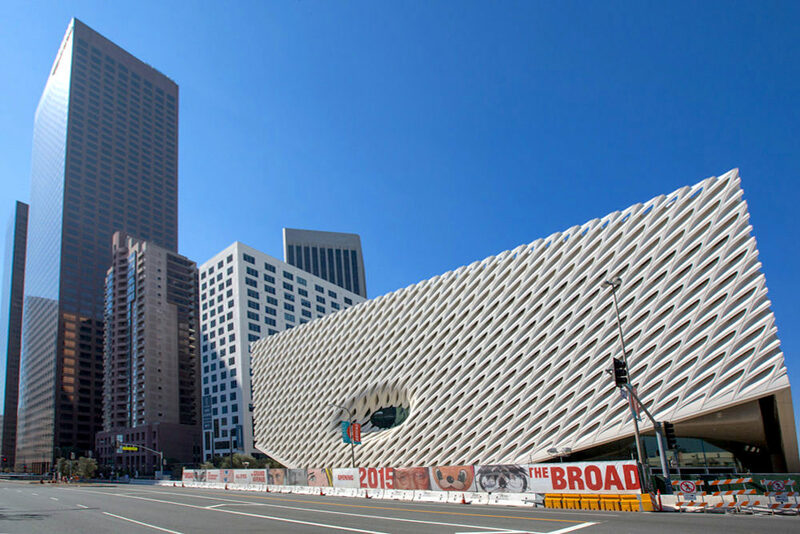 When the museum opens in September, it will house 2,000 postwar and contemporary artworks from The Broad Art Foundation and the personal collection of Eli and Edythe Broad. It will operate with an endowment of more than $200 million and admission will be free. Sunday’s preview event sold out within minutes of availability and media buzzed with images all day. Meanwhile, a line formed across the street for admission to the final day of MOCA’s Andy Warhol exhibition. Well played, DTLA. See codylee.co/the-broad for our earlier post.